Pilfer: Draw a random support from your deck. Dagi-raht Mystic is an epic Willpower creature card. It is part of the Core Set. "Their power will be Khajiit's." "This one's power is mighty!" 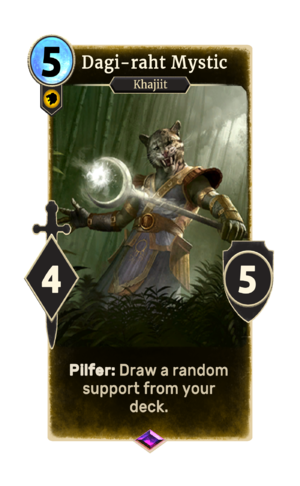 The card is named for the Dagi-raht subspecies of Khajiit. This page was last modified on 15 February 2019, at 11:53.